Provides coverage for individuals, families and groups who need temporary medical insurance while traveling for business or pleasure anywhere outside of your home country. International travel can quickly turn into a frightening situation if you’re not prepared for a medical emergency. Most travelers assume they will be covered by their standard medical plan, but that isn’t the case. While traditional plans may offer adequate domestic coverage, they are not designed for international travel. Without even realizing it, you may be putting your health at risk. Don’t let your medical coverage be an uncertainty. 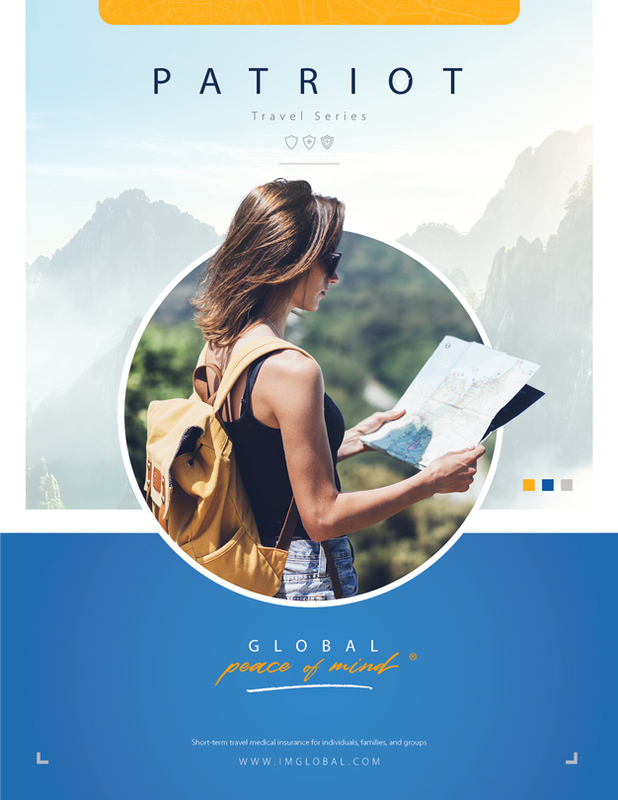 Travel with one of IMG’s two Patriot Travel Medical Insurance® plans so you can spend more time enjoying your international experience and less time worrying about medical coverage. Patriot International® provides coverage while traveling outside your home country where the destination excludes the United States or its territories (limited coverage for brief returns to the United States or its territories). Patriot America® provides coverage while traveling outside your home country where the destination includes the United States or its territories. Patriot International insurance is available for those traveling outside of the United States and Patriot America is available for non-U.S. residents whose travels include the United States. You must pay the required premium on or before the effective date of coverage and must have legally entered your destination country on the effective date. All applicants must be at least 14 days old, and cannot be HIV+, pregnant, hospitalized, or disabled on the plan effective date. To apply for this plan, simply complete the online application by clicking "Get Quote". If you are applying as a family, you may include yourself, your spouse and dependents on one application. If you have dependents who are 19 and older, you must complete a separate application for those individuals. You must accurately complete all questions outlined in the application in order to be considered for coverage. If approved, you will receive a fulfillment kit, which includes an identification card, declaration of insurance and a Certificate Wording containing a complete description of benefits, exclusions and terms of the plan. You are required to notify IMG, as required by the terms of the plan, if you or any family member suffers from or is treated for any illness, injury or other medical condition between the time of your application and the issuance of the certificate. If your application is not approved, you will receive a full refund of any premium received by IMG. Subject to the terms of the plan, Patriot Travel Medical Insurance can be extended for a minimum of five days up to a 365-day period, until reaching a maximum of 24 continuous months. Prior to the end of each period of coverage purchased, you will receive renewal information. You have the option to renew online or you may complete a paper renewal form. Each insured person must only satisfy one deductible and coinsurance within each 12-month period of coverage. Search our database for medical, dental and other care providers. "Although one hopes never to use travel insurance, IMG was a god-send throughout our ordeal. We couldn’t have done it without your continued assistance." that IMG had my back." While skiing in Chile, Mark, an IMG member, found himself on the brink of paralysis.